Multi-colored butterflies around two open hands. Each arm wears colored wristbands listing disabilities and conditions. The wristbands on the left arm read: “multiple sclerosis”, “muscular dystrophy”, “down syndrome”, “developmental delay”, “chronic pain”, “mental illness”, “heart defect”, “graves disease”, “Starge-Weber”. The wristbands on the right arm read: “Tourettes”, “Cystic fibrosis”, “epilepsy”, “spinal bifida”, “dystonia”, “ptsd”, “cerebral palsy”, “lupus”, “hearing impairment”. The butterflies represent different disabilities. What I hope to convey is that they are all just so beautiful all together in their differences. The butterflies fly in a heart shaped pattern. They are not forced into this pattern. They are united together in a love greater than themselves. I have been drawing and painting most of my life. I have a love of color and have always been interested in drawing people. 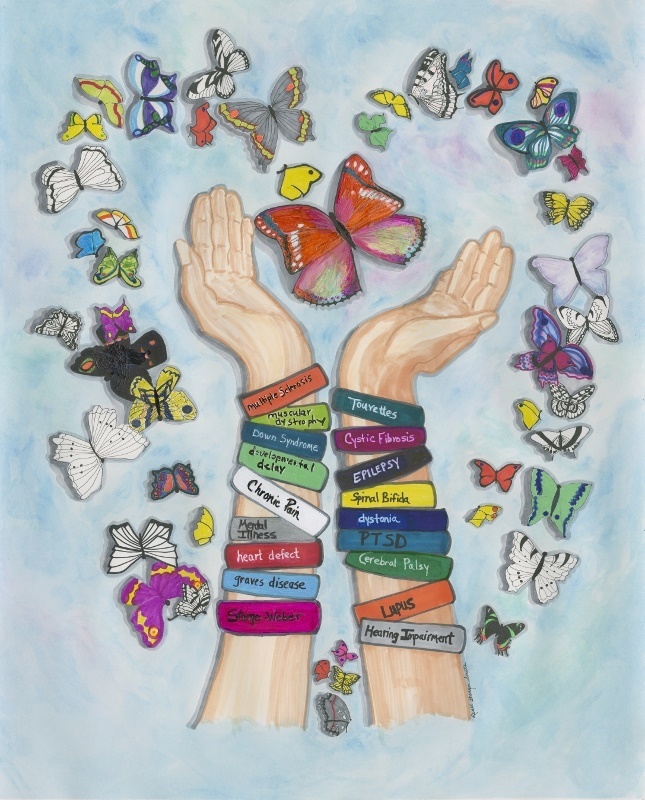 In this piece, I have a pair of arms wearing many disability awareness wristbands, and the hands are releasing many butterflies. I see the butterflies as representing the different disabilities we can have. There are colorful butterflies and then there are black and white patterned ones. What I hope to convey is that they are all just so beautiful, so beautiful all together in their differences. I have the butterflies fly in a heart shaped pattern. They are not forced into this pattern. They choose to do so as they are united together in a love greater than themselves.